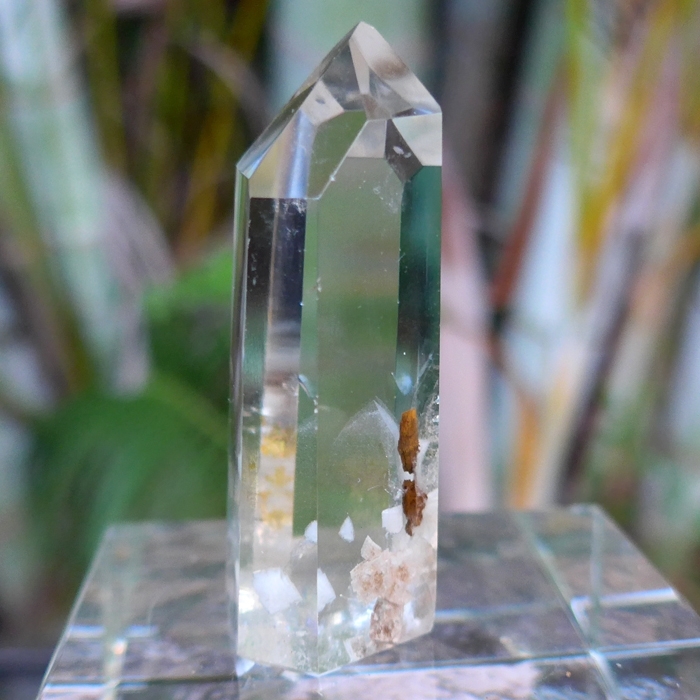 Dimensions (HxWxD): 2.4" x .98" x .75"
This rare, gorgeous, energetically powerful 2.4 inch high Polished Phantom Window Generator with Hematite, weighing 1.35 oz. or 38.3 grams, comes from Minas Gerais, Brazil. We obtained this beauty from the collection of AGTA Fashion Forward award winning gemologist and jewelry designer Brian Cook. You can see a beautiful inner landscape with a faint phantom formation and a smattering of colorful reddish-brown crystallized hematite (iron oxide) inclusions near the bottom of the water clear shaft. Iron oxide infused crystals are said to resonate with the energy signature of Archangel Michael. You can see the phantom in the bottom picture on this page. This specimen also features a diamond shaped window between two faces of the termination tip. Window quartz is so called when there is a diamond, rectangular or four sided face between the tip facet & the body. These forms are said to be a 'window' to the soul, to help one access the intuition without the interfering mind, ego or emotions. It is helpful using a ‘past facing window’ (one which points to the left), to access information which may be helpful on your current journey, or something which must be retrieved in order to be completed or to gain closure & understanding. A forward facing window is one which angles to the right and can be used to access information similarly from the future. 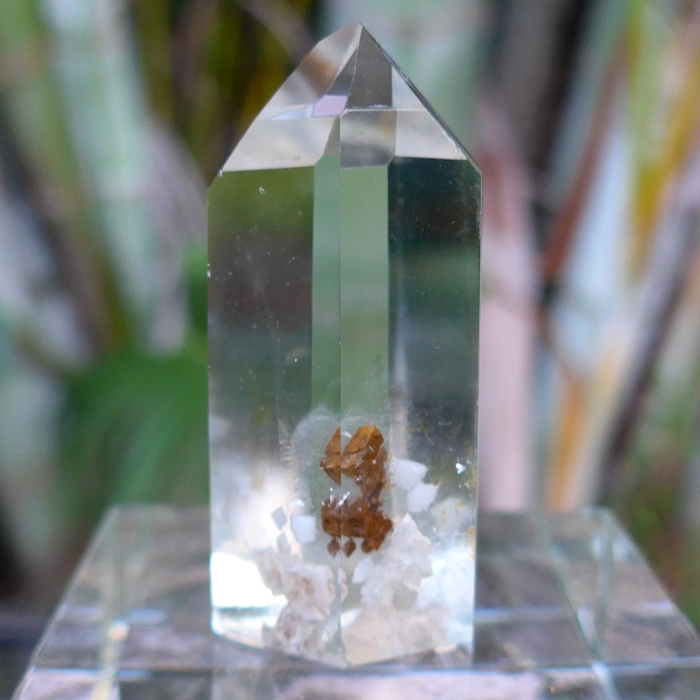 This polished Phantom Window Generator Crystal contains hematite, or iron oxide, inclusions, giving it a distinctive metaphysical connection with Archangel Michael. 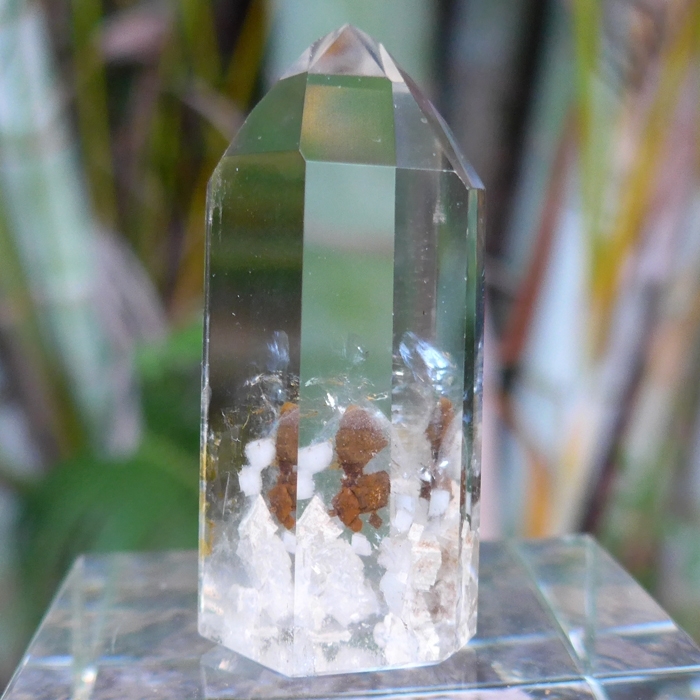 Esoteric Christianity makes a link between hematite and Archangel Michael, and a quartz crystal containing hematite can provide the bearer with a powerful connection to Michael, providing access to the Archangel's loving wisdom and power to dissolve illusion through the activity of his famous sword, the sword of Ultimate Truth. During the Libran lunar month in the northern hemisphere, the Draconid meteor showers will be visible. At this time of year, when sensational meteor showers, largely composed of iron, traditionally streak across the night sky, Esoteric Christian philosopher Rudolph Steiner’s clairvoyant vision saw the traditional flashing iron sword of Michael. The meteoric sword of Michael was thought to cleanse the Earth’s atmosphere of summer's sulfurous influences, allowing the Higher Self to emerge and guide the initiate along the path of Spirit toward the birth of the Inner Christ Light, an event which takes place in December, during the festival of Christmas. For more information on Michaelmas, see Libra Festivals: Michaelmas, Rosh Hoshanah, Ramadan and Navratri. Hematite "assists in the dissolution of negativity, transforming the negativity, in the dissolved state, to the purity of the universal light of love," according to Melody. "It can be used to stimulate the desire for, and to facilitate the attainment of, peace, self-control and inner happiness". Note: Above weight is shipping weight. Net Weight is 38.3 grams or 1.35 ounces.